Miss Print: What I've Been Up To and a Giveaway!!!! What I've Been Up To and a Giveaway!!!! That's right people! For the last little bit (it's not been quite two weeks since I last blogged) I've been busy, busy finishing up all of my final papers and research, and now I am done! I handed in my last paper on Monday and it felt good! My official convocation isn't until June but I'm done all of requirements, so I'm calling myself a Master of Information now (and yes, that is actually what my degree is called)! What do y'all think about that?! 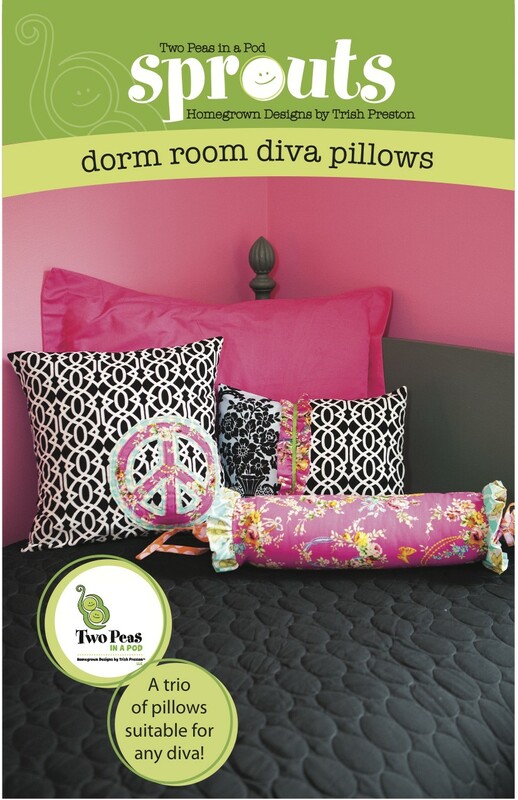 This is group one which includes both the Madison Bag pattern and the Dorm Room Diva Pillows pattern. And this is group two which includes both the St. Mary Backpack pattern and the Farmhouse Funk Pillows pattern - remember you can click on any of the pictures to make them bigger if you want some detail shots! All patterns are also available through Trish's Etsy shop (check it out to see some more of her patterns) and they are also being sold and distributed by a number of quilt shops and companies (*ahem* McCall's *ahem*) so if you don't win my little giveaway you'll still be able to pick these babies up! comment and you will be entered a second time. There you go - two chances to win! Please remember to leave two separate comments for each entry or yours will only be counted as one - also, remember that I have comment moderation set so if your comment doesn't appear right away it just means that I haven't approved it. I'll announce the winner of the giveaway here on the blog next Thursday! Who wants to come up to Toronto to celebrate with me?! 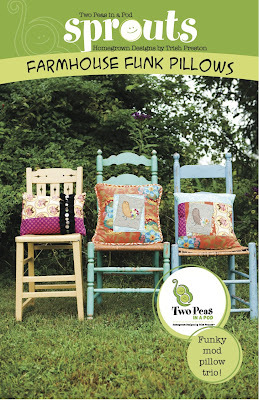 Or, if you're going to Quilt Market next month, maybe we could all get together and have a little party - yes please! Congrats for completing your masters. I'm a follower and if I win, just gimme anything. Congratulations, Kaye!! That is absolutely fabulous!! I know that's a lot of work (my daughter finished hers last year) and you are so relieved to be done! Great giveaway, too - both sets are great, but I think I like Group One best. WHOA! CONGRATS!!! That must be a wonderful feeling to have finished! ooh, i'd like one of the pillow patterns. yup! Congrats on the Masters! What a great accomplishment! I love the fun giveaway - my daughter in college would love me to make that St. Mary's backpack and some of the fun pillows! thank you for the chance to win! I am a follower of yours - congrats again! Yay! Congrats on being an information master! I'd love to win. Great patterns. What a grand feeling to have accomplished such a great thing! Congratulations! Package #2 please...it'll work well in my daughter's sorority room at school! congratulations on ur masters kaye! Youre an inspiration and wishing you all the best. That is an awesome accomplishment! Congrats! I like both but if I must choose, I'd say the St Mary backpack and Funky pillows. Thanks for the giveaway! I am a happy follower! Where will you lead? And PS. What is your masters in??? Congrats! I love group one! Congratulations!!! I would love to have the Pillow pattern, so cute! Congratulations on your masters! I am still working towards my AA and then Bachelors, so I know it took a lot of work! For the giveaway, I would prefer group 1, but both have great patterns. Thanks so much! I would love either, both sets look great! Thanks for the chance! I am so a follower of yours. So glad your back. Huge congratulations to you - and what does a Masters of Information qualify you to do??? Congrats! It's such an amazing accomplishment. 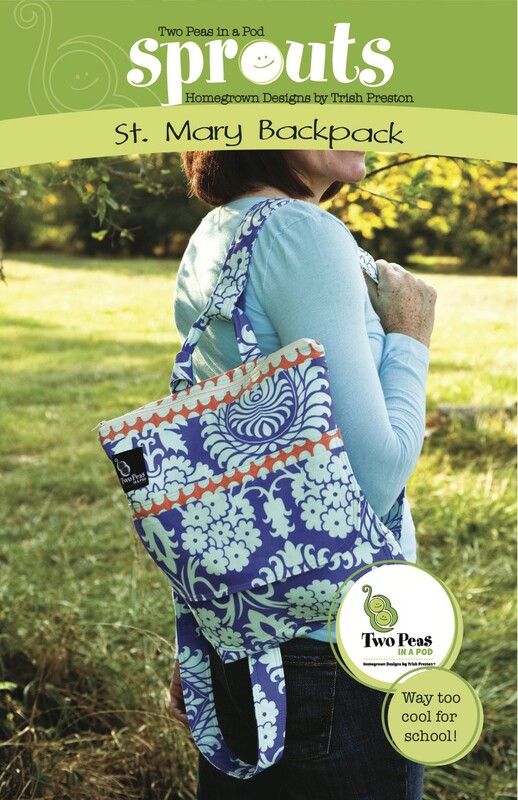 I would definitely love to win the second set of patterns. Thank you! Congratulations on your MASTERS! Very exciting! I Luhuuve those funky pillows! They would be fun to make. I would go for either but really like group one. OMG! OMG! OMG! You must be freaking out excited! Congratulations!!!! Wow! Congratulations! The Madison Bag and Dorm Room Pillows are the cutest! congrats! my husband just finished his masters too! what a relief it is! Congratulations on a job well done. That is hard work! I have been following you along the way. Group one looks great to me! Just wanted to say congratulations! You should be super proud! Congrats on completing your Masters. That is a huge accomplishment. I guess my fav group, if I have to pick, is group one. I'm such a fan of Two Peas in a Pod. Thanks for the giveaway! Huge accomplishment, congratulations to you! I like the Farmhouse Funk! I really like that Madison bag so I'd pick the first set! And CONGRATS!!! what a fantastical accomplishment! Big huge congrats to you, you must be so proud of yourself!!! I would love to enter in the Madison Bag/pillows pattern group. That little bolster pillow is really cute. I think I became a follower when I found your first MBS shop project! Thanks for a ll the inspiration! Congrats! I like both groups...but if I have to choose, I pick group 2. Congratulations on completing your amazing degree!!! I just pretend I'm a Master of Information all the time, but you've got the paper to prove it, so WAY TO GO!!!! All the patterns are beautiful, but I think Group#2's my favourite! I'd love a chance to enter for Group #2! Congrats on finishing your masters! That's a great accomplishment! Thanks for the giveaway to celebrate. If I win I would like the second group. I am a follower via Google Reader! Thanks again! Congratulations Master Prince!! Have you got your cap and gown yet?? FANTASTIC NEWS KAYE!!! Congratulations. Now I know what that huge sigh I heard Monday night was way over here in Illinois. LOL It was YOU turning that last paper in. HA So the biggest question I have is this ~ Did you go out and celebrate that night? :) I'm sure it felt really good. Gosh, picking which group is really tough because I LOVE the Madison Bag and the Farmhouse Funk Pillows the most of all four. 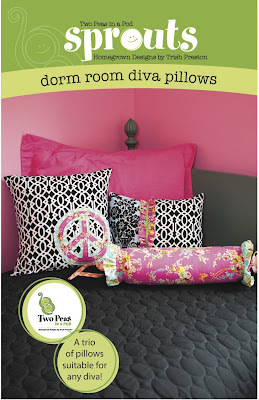 If I am lucky enough to win I would have to choose the Madison Bag and Dorm Room Diva Pillows. So ~ now that you are the Master of Information could you please tell all of us what the next winning lottery numbers will be? LOL Seriously, when attending our local community college before meeting my husband and leaving the studies, I was working on a degree to become a Computer Information Specialist but that was an Assoc. Degree. Seriously though, what exactly is the the type of work one does with your degree? I am also a follower of your blog Kaye. I've been following for a long time with my RSS feed in my IE browser. Now I finally became a "real" follower too. I pick the first group. Much congratulations. That had to have been quite a lot of work. I'd love to win the bundle with the backpack. Congrats to you! Lot's a hard work pays off! Thanks for the chance to win one of those beautiful patters. I think the St. Mary's Backback pattern is my favorite. Thanks!! A HUGE congratulations to you! what an effort! I'd love group 2 pls. Congratulations. What a wonderful accomplishment. One of my daughters is still working on hers and it is a long path filled with hard work. I would pick the first group in your giveaway. Thanks for the chance to win. Great patterns! I particularly like the Madison Bag, so I'd like to win that grouping. And congratulations on your Masters! That is a huge accomplishment!! Enjoy! I follow your blog on Google Reader - it's great! Keep up the good work! I prefer group 1 ...all of them are cute though! First I would like to congratulate you on finishing your Masters degree. I know how much work it is as I have also just finished mine - mine was called Information Systems Engineering. I'm not acutally walking - more money and it's during the work day and I already got the certification. Anyway, more time for fun stuff for us! 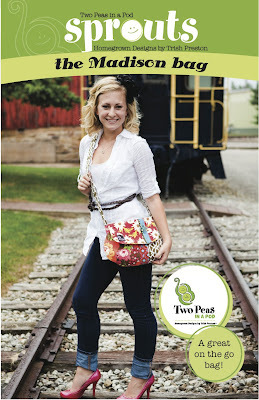 As for the giveaway, I am liking the backpack and the funky farmhouse pillows! Thanks! Congratulations! And thanks for the chance -- I'd pick number 2, but either one looks great! oh and I was already following and if I win (and why not?) I would choose no 2. Congratulations on the Masters! What an accomplishment! congratulations! i know that is a huge relief to have finished. i love the st. mary's bacpack. Congrats on finishing your masters! What an accomplishment! I would love to win the first set of patterns, the one with the Madison bag. Awesome! I am a blog follower through Google Reader! Congratulations on your Masters. WOW!!! I would love the second set of patterns with the farm pillows in it. Thanks and congratulations again. Congratulations doesn't seem like enough for such a wonderful accomplishment, but CONGRATULATIONS! Oh congratulations on finishing your work, must feel really good!! Congratulations on finishing your Masters! I would love to win Group 2. 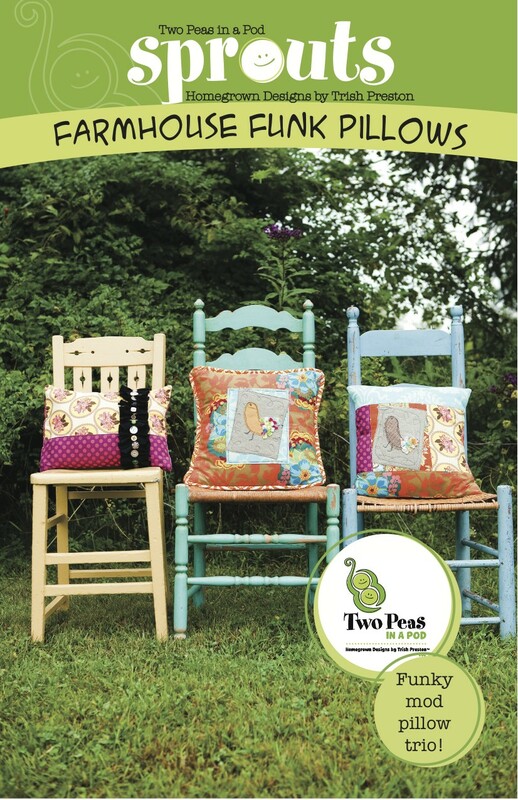 I'm a follower of yours AND I ADORE the farmhouse funk pillows! Congratulations to you for completing your masters! I would like the patterns in Group 1. Thanks for a chance to win! Congratulations! That certainly is an accomplishment! I would love the Madison bag group. Now I am off to become a follower. OK now I am following! Get Stacked - a New Quilt! Yarn prettiness and the giveaway winners! New Pattern Release and a French Knot Tutorial!